You can talk to our technical team on 0871 200 2082 and we are here Monday - Friday 8am - 5pm. Also feel free to email us with any enquries and we will get back to you as soon as we can. Made here on site and is made with extra strength and durability. You can store your rainwater underground. 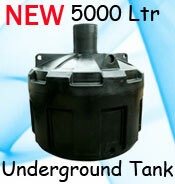 Underground Rainwater Harvesting Tank 5000 Ltrs. 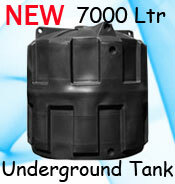 Underground Rainwater Harvesting Tank 7000 Ltrs. You can use your stored rainwater to flush your toilet, use the dishwasher which are a few of many areas where large amounts of water is used at a time. From 280 litres to 25,000 litres, above ground or below, we can cater for your every need! If you are looking to save water for your garden and want to do it yourself, we would recommend an above ground DIY rainwater harvesting system. All you need is basic DIY skills, a drill with a hole-cutting attachment, and a saw. Simply cut your down-pipe (you may need an extra bracket), drill a hole 50mm from the top of the tank and fit your down-pipe diverter. Now you’re ready to harvest rainwater – and you’ve done it all yourself! 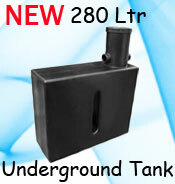 We have a massive range of quality tanks in popular colours. They’re built to last and they look good too. Totally weather resistant, they will not crack in frost or fade in the sun. Put them anywhere you like. Behind a shed, against a wall, in a poly-tunnel or in a greenhouse – we aim to have a tank for every location! Include a pump of your choice. We supply a wide range of submersible, amphibious and booster pumps for the more experienced DIYer. If you need more capacity, just link our tanks together with our easy to use tank connection kit. This is DIY rainwater harvesting at its easiest! And it looks good too! When people think about having an underground rainwater harvesting system, what automatically comes to mind is a lot of work and installation.This can be off putting for some and others may just need a bit more of an easy guide and system to do the job themselves. Anyone can install a rainwater harvesting system and Ecosure have now come up with the Easy Hydro systems. Perfect for easy DIY rainwater harvesting and are designed to be installed by a competent DIY enthusiast. Water is channelled from the downpipe, through a filter into the underground tank. It is then pumped to an external tap. Once installed, the system is discreet, but easily maintained. The Easy Hydro System employs what we believe to be the most efficient amphibious pump on the market. Engineered and manufactured in Britain, it comes with a TWO year warranty. It is an electronically controlled, pressure sensitive centrifugal roto-dynamic pump, with a built in non-return valve and double run dry protection. Our underground tanks, which are available in a variety of sizes from 1,100 to 7,000 litres, are also UK designed and manufactured. Made of tough MDPE, they are durable and require only routine maintenance. We never use anything but virgin polymer for our underground water tanks and always quality test our products to ensure high standards are maintained. An excellent all-round simple solution to your rainwater harvesting needs! The Easy Hydro Plus Systems and the same as the easy hydro systems except they come with a back up box so that when the water runs out of the water tank it automatically switches over to the mains water so that if you are relying on having water that you are not left dry if the water tank does run out.